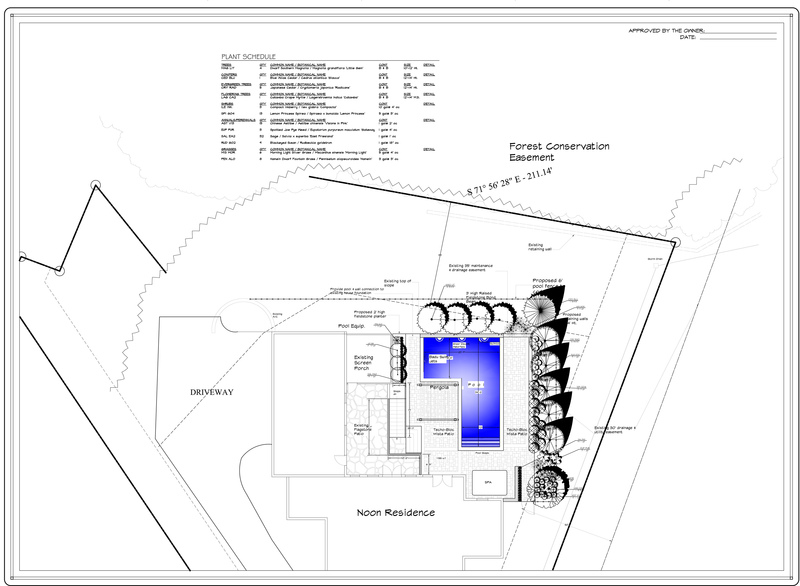 A Modern Towson MD Swimming Pool and Pergola - Land & Water Design, Inc.
Just how did we take a challenging site with a conservation easement and create a stunning Towson, MD swimming pool project with a modern-yet-classic backyard? 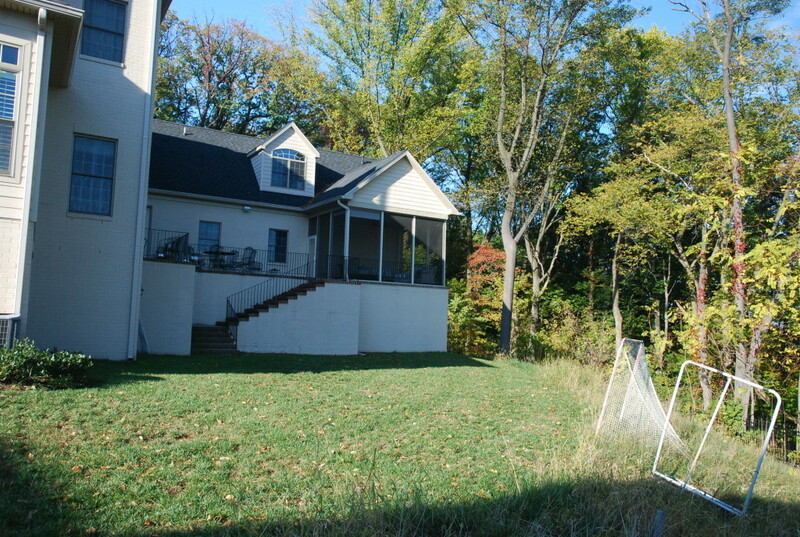 Walking into the backyard of this home in Towson, MD we were presented with a number of landscape design challenges. The usable backyard was shallow, ending with a steep drop off to a conservation easement below. Another challenge was, all the outdoor living space was tucked up against the house. The only access to the yard was from the first floor, the patios and screen porch was positioned on the upper level, making it much harder to create a welcoming space. 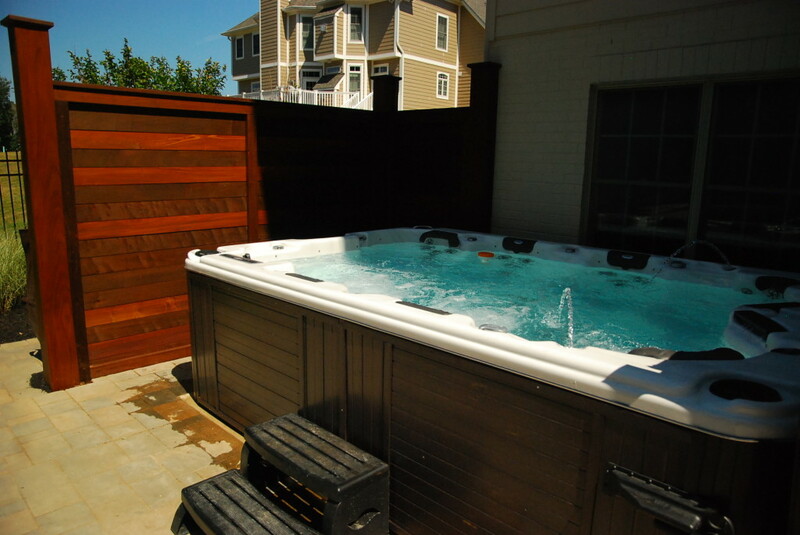 The client’s request was relatively straightforward: a professional athlete, he wanted an exercise pool and a hot tub with plenty of therapy jets. As someone who loves to entertain, he also wanted the space to be beautiful and welcoming for his guests. We set to work on the landscape design process and developed a concept that met his needs. 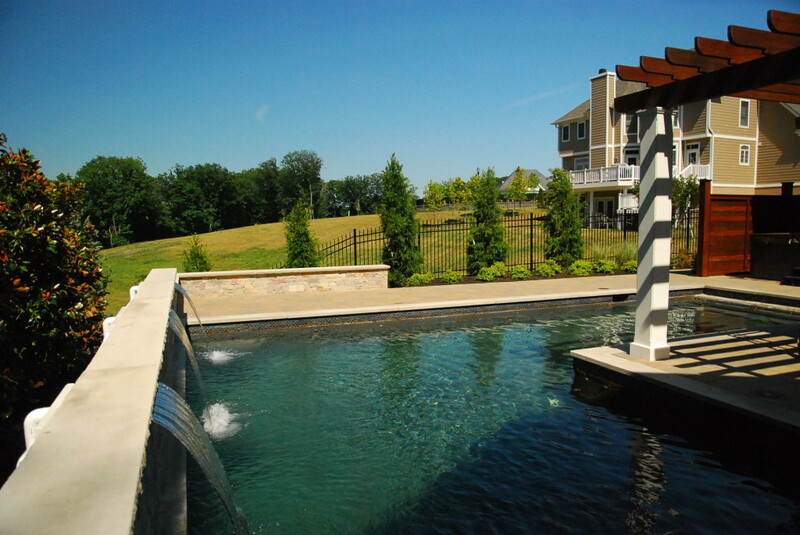 This Towson, MD swimming pool project began, naturally, with the pool. 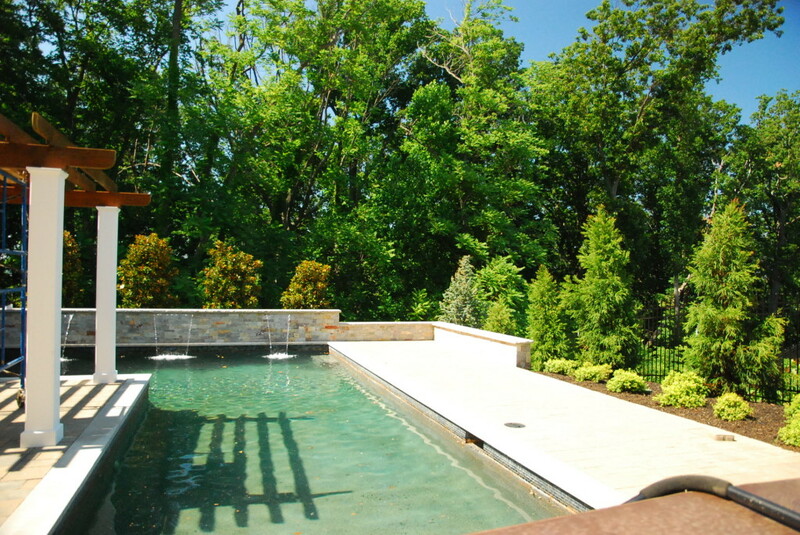 The L-shaped pool was designed to sit at the edge of the slope, allowing us to make the backyard as large as possible. Because we had significant space limitations and the client wanted an exercise pool, we installed a jet system to allow for resistance swimming. When a pool sits at the edge of a slope, we can do one of two things. We can emphasize the dropoff with a negative edge, or we can minimize the dropoff with a raised beam at the end of the pool. We opted for the latter which allowed us to create a raised wall with beautiful natural stone veneer and three sheer descent waterfalls. 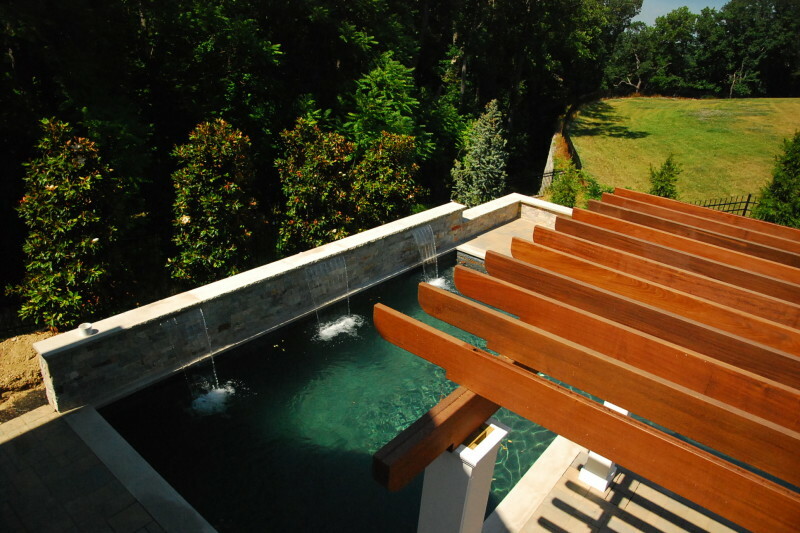 The grade change to the woods below is so great that in doing this, we evoked the feel of a rooftop pool and garden with a parapet wall at the end of the pool. The pool deck provides ample space for guests. 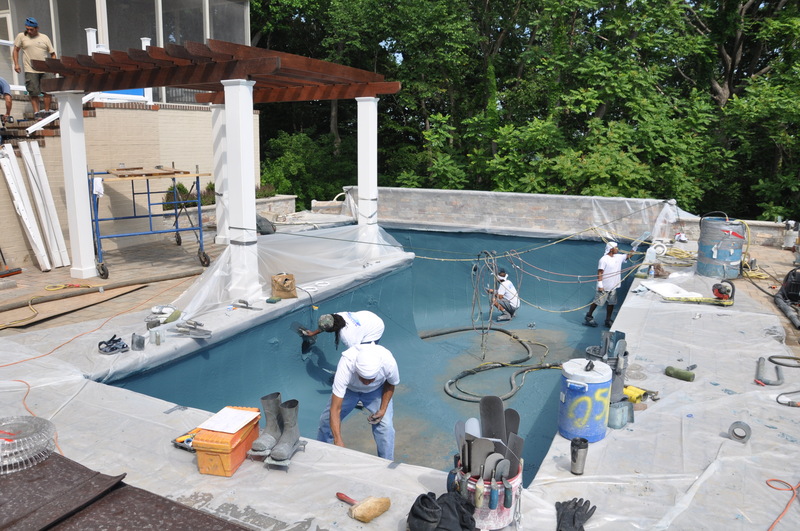 We desired a durable, low-slip surface and opted for Techo-Bloc’s Athena pavers for the pool deck. An Ipe pergola defines the space at the inside corner of the L-shaped pool while helping mitigate the height difference between the upper deck and lower pool area. We also updated the existing upper deck, removing the old metal rails and installing a composite rail system with tempered glass panels, providing a much more modern look. We incorporate several modern touches, like this and the horizontal Ipe screen panels, which allowed us to create a contemporary space, that still respected the architecture of the house and the neighborhood. No landscape project is complete without plants, and this was no exception. The space constraints meant a limited plant palette, but we selected; Cryptomeria (Japanese cedar) to provide privacy from the neighbors, Southern Magnolias behind the pool to blend the landscape into the woods beyond, and throughout a variety of ornamental shrubs and grasses. The lush greenery of the woods behind the house was an asset that we took full advantage of, and it helped brand a new landscape feel like it belonged from day one. Do you have a challenging site, or just a desire to turn your backyard into the retreat you’ve always known it could be? Contact us today to learn how Land & Water Design can make your landscape everything you knew it could be.